ONE: Cut the Stephenson Jelly Melt and Pour into small pieces. 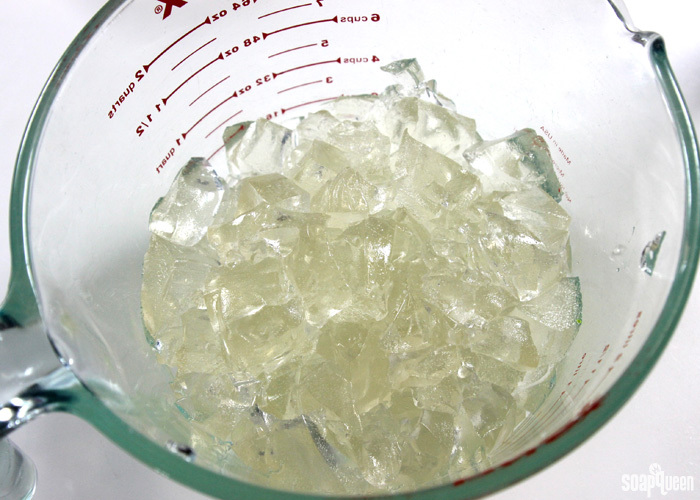 Place in a large heat safe container and melt using 1 minute bursts. This melt and pour base takes a little longer to melt than regular melt and pour soap, so longer bursts are needed. Keep stirring between each burst but only a few times; jelly soap has a tendency to create bubbles. Because the soap base is so thick, the bubbles do not rise to the top like regular melt and pour bases. Once melted, remove from the microwave. The base will be thick. Split the soap into two even containers. TWO: To one container, add the Spellbound Woods Cybilla Fragrance Oil and Vanilla Color Stabilizer. This prevents the Spellbound Woods Cybilla Fragrance Oil from discoloring the soap brown. Read more about fragrance discoloration here. To the other container, add the Applejack Peel Fragrance Oil. Stir gently to incorporate while avoiding creating bubbles. THREE: To the container with Applejack Peel Fragrance Oil, add the diluted Green Apple LabColor and gently stir to incorporate. If the base begins to harden and cool, place back into the microwave using 30 second bursts to melt. FOUR: To the container with Spellbound Woods Fragrance Oil, add the diluted Easter Purple LabColor and gently stir to incorporate. If the base begins to harden and cool, place back into the microwave using 30 second bursts to melt. FIVE: Place two to three spider toys face down in the mold. Spritz with rubbing alcohol to help the spiders stay in the soap and slowly pour the green and purple soap into the molds. 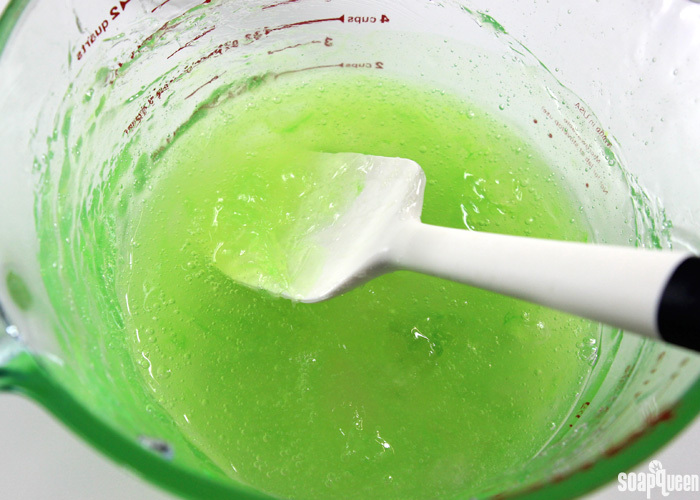 We found this recipe comfortably creates 3-4 soap jellies in each color. Because the soap is so thick, spraying the top with 99% isopropyl alcohol is not needed. The alcohol does not work very well to disperse bubbles. Allow the soap to fully cool and harden for several hours. Gently remove from the mold. During our tests, this base was fairly resistant to glycerin dew. Our soap was left in the open for a week and did not form glycerin dew. But to be on the safe side, wrap the soap in plastic wrap to keep them in tip-top shape. Learn more about storing your soap here. To use, tear off a small piece of the soap and work it into a lather with a loofah, washcloth or sponge. 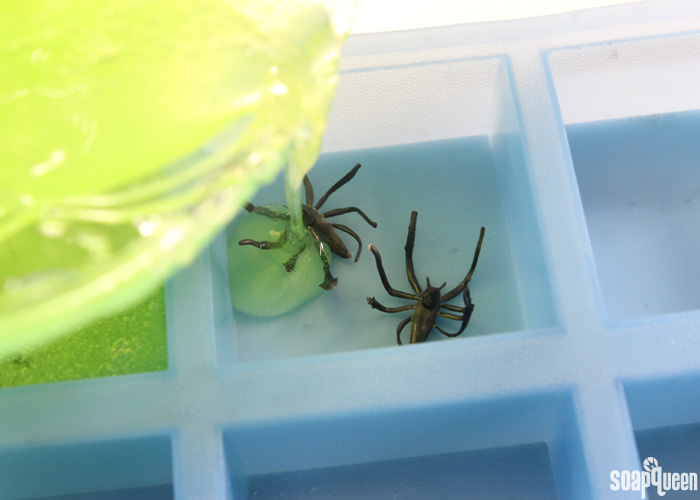 Some like to freeze soap jellies to harden the product. In our tests, freezing the Stephenson Jelly Soap Base did not produce a completely hard soap; it was still quite wiggly and soft. 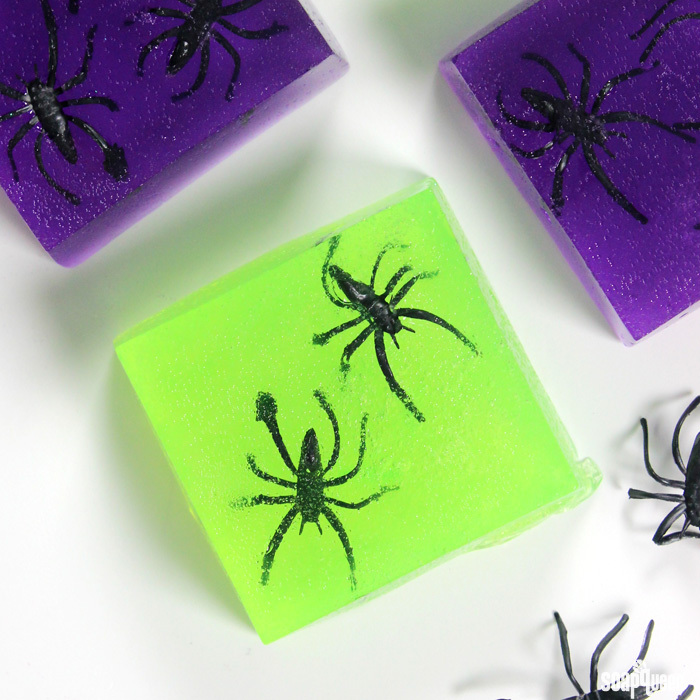 These Creepy Crawly Spider Soap Jellies are super wiggly, making them perfect for Halloween! Cut the Stephenson Jelly Melt and Pour into small pieces. Place in a large heat safe container and melt using 1 minute bursts. This melt and pour base takes a little longer to melt than regular melt and pour soap, so longer bursts are needed. Keep stirring between each burst but only a few times; jelly soap has a tendency to create bubbles. Because the soap base is so thick, the bubbles do not rise to the top like regular melt and pour bases. Once melted, remove from the microwave. The base will be thick. Split the soap into two even containers. To one container, add the Spellbound Woods Cybilla Fragrance Oil and Vanilla Color Stabilizer. This prevents the Spellbound Woods Cybilla Fragrance Oil from discoloring the soap brown. To the other container, add the Applejack Peel Fragrance Oil. Stir gently to incorporate while avoiding creating bubbles. 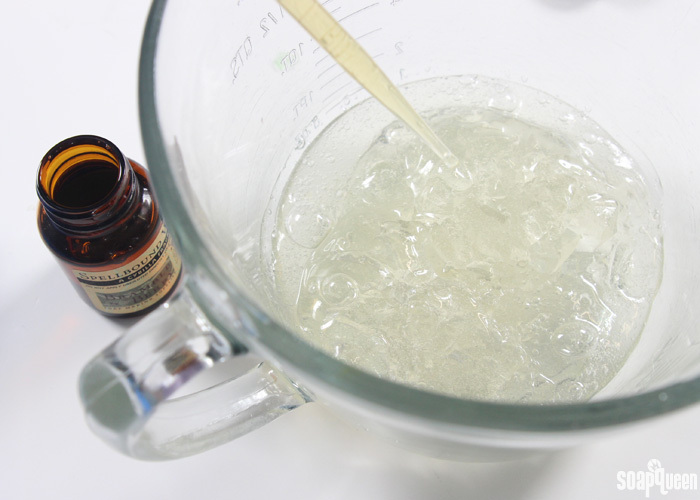 To the container with Applejack Peel Fragrance Oil, add the diluted Green Apple LabColor and gently stir to incorporate. If the base begins to harden and cool, place back into the microwave using 30 second bursts to melt. To the container with Spellbound Woods Fragrance Oil, add the diluted Easter Purple LabColor and gently stir to incorporate. If the base begins to harden and cool, place back into the microwave using 30 second bursts to melt. Place two to three spider toys face down in the mold. 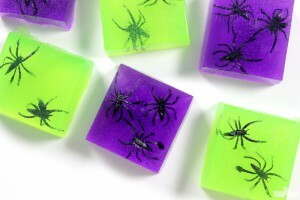 Spritz with rubbing alcohol to help the spiders stay in the soap and slowly pour the green and purple soap into the molds. 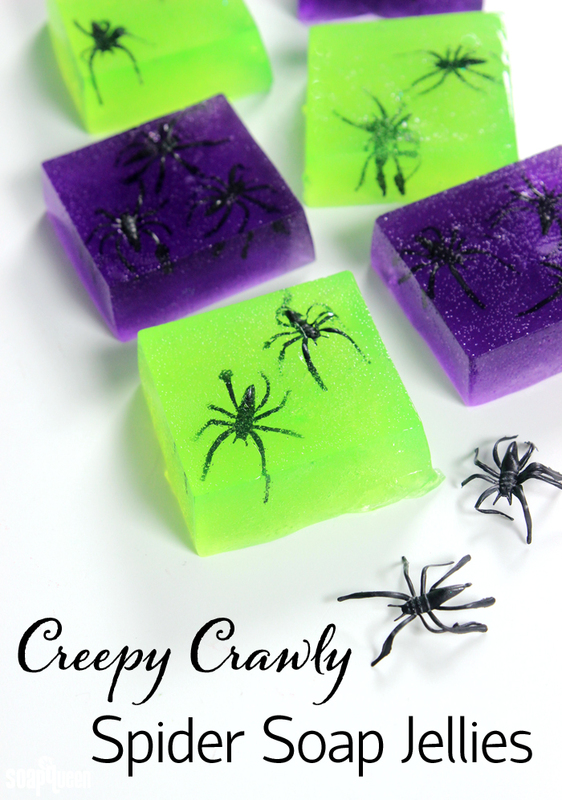 We found this recipe comfortably creates 3-4 soap jellies in each color. Because the soap is so thick, spraying the top with 99% isopropyl alcohol is not needed. The alcohol does not work very well to disperse bubbles. Allow the soap to fully cool and harden for several hours. Gently remove from the mold. Will this need any added preservative because of the added water used to disperse the colors? I’m reposting my comment since I never heard back and I’d like to try and make these soaps soon. Hi, I’m looking to make this soap this weekend and I’d like to confirm how I should store it. In following Instagram it sounds like the soap should be wrapped in plastic until time to use. My question is, once the soap is sitting in the soap dish is it okay to sit out until it’s gone (which could be weeks)? I thought I read on Instagram it could sit out a week but would then begin to turn into a liquid. I’d like to confirm because that will determine if I decide to share my final product with friends or end up using it up at home. Thanks! nce used, I would recommend storing this soap in an area where it will not sit in water. A soap dish with holes on the bottom should do the trick. Like any soap, if it’s left to sit in moisture it will begin to soften, and you could certainly end up with a very soft, gooey mess rather than fun jelly soap! If you give to family and friends, you may want to instruct them to invest in a good soap dish, or just tear off small amounts of the soap before use and leave the remaining soap in a jar or other container. Thanks for your response. I think I can pick up some soap dishes (with holes in the bottom) at the Dollar Store and can give that to friends along with the soap. Hopefully that will ensure it doesn’t turn into a jelly puddle. Can’t wait to actually make the soap! I do have a question tho… Does this base have the same fragrance load as melt & pour? Good question! It does. 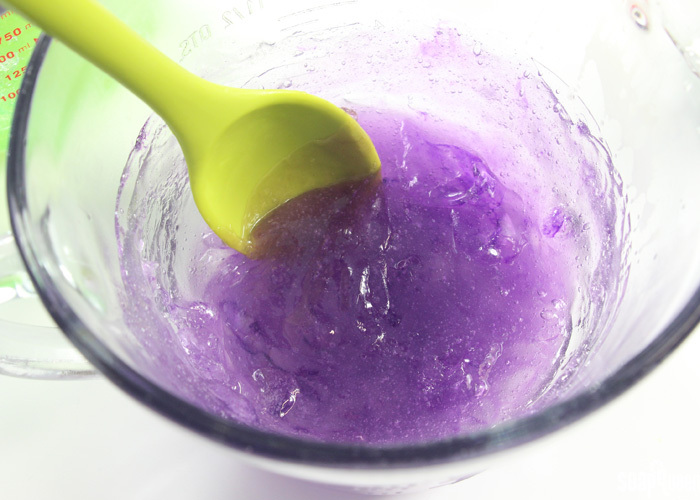 You can use the same amount of fragrance oil in the Jelly Soap as you would in regular melt and pour base. When using the Fragrance Calculator, select “melt and pour.” I hope this helps! The spiders are out of stock!! Do you know when you’ll get more in? Can any little plastic spider work? I don’t have Facebook for uploading photos, but I’ve made a few soap projects with glow in the dark pigment – its a riot. This looks so fun! And the jigglyness makes it more perfect for Halloween 🙂 Would be a fun project with the kids!